There is an interesting story behind Sivalaya Ottam ritual during Shivaratri festival. Legend is that Doumaya Maharshi’s son Vyakrapandan was a great devotee of Lord Shiva. Bhima was given 12 Shiva Lingams by Lord Krishna while inviting Vyakrapandan for the Aswamedayagam. Sri Krishna also directs Bhima to chant the names of Lord Vishnu while he meets Vyakrapadan. Vyakrapadan was disturbed when he heard the names “Govinda, Gopala” and he chased Bhima for irritating him. On his way Bhima dropped the lingams one by one and it is believed that these lingams later became the 12 Shiva temples of Sivalaya Ottam. Shivalaya Ottam begins at Thirumalai Shiva Temple at Munchirai and concludes at the temple of Thirunattalam where we can find Ardhanarishwarar (Lord Shiva and Goddess Parvathi) and Sankara Narayana (Lord Siva and Maha Vishnu). It is which means that Hari and Haran are the same. EMAIL NEWSLETTER$desc=Subscribe to receive Hinduism articles and updates. Kayena-Vaacha Mana-Sendhriyerva, Buddhyatma-Naavaa Prakrute-Swabhawat, Karomi Yadyat Sakalam Parasmai, Naaraa-Yanayeti Samarpayami, Ohm Tat Sat. 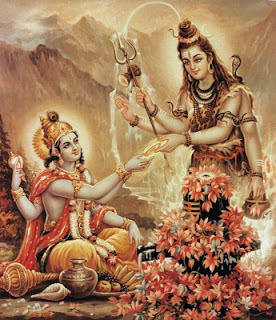 I offer all that I do, To Lord Narayana, Whatever I do with my body, Whatever I do with my mind, Whatever I do with my brain, Whatever I do with my soul, And whatever I do with natures help! Om that is the truth.